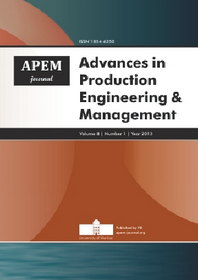 Advances in Production Engineering & Management (APEM journal) covers theoretical and application-oriented research in a wide range of production engineering and production management. The scope of the APEM journal reflects the interdisciplinary nature of the field. The journal publishes mainly original research papers but also review and professional articles. All articles published by the journal are accessible online immediately after publication. The open-access policy of the journal provides authors with several advantages, including increased visibility of the papers to a wide global audience. Advances in Production Engineering & Management is abstracted and indexed in the world’s leading bibliographic databases, including Web of Science (now maintained by Clarivate Analytics, previously by Thomson Reuters) and Scopus (maintained by Elsevier). The Web of Science Impact Factor for this journal is 1.596 (Journal Citation Reports 2018, year 2017).